Art.no. 909168000 Color: Gray Quality: 95% cotton, 5% elastan This is the new time. This is the new generation. This is the Alabama Drop Crotch Jogger! 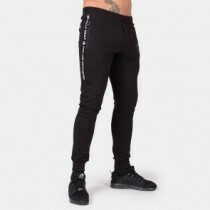 This comfortable jogger has two metal zippers in the front as well as one metal zipper on the back. In addition, we added two metal eyele..
Bruce Men's Tights Art. no. 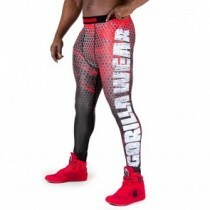 90929905 Color: Black/Red Quality: 72% polyester, 28% spandex These Gorilla Wear USA men’s tights fit like a second skin. It is designed with stretch fabrication that allows the user great mobility in any direction. As usual Gorilla Wear USA always uses the..
California Mesh Shorts Black/Grey Art.no. 9091190810 Color: Black/Grey Quality: 100% Polyester Our gorilla development team proudly presents: The California Mesh Shorts! Made from a high quality mesh fabric complete with a microfiber strip on the side for ultimate..
Art.no. 909159000 Color: Black Quality: 80% Cotton & 20%Polyester This Joggers is just right. They are not too wide and they are also not too tight fitting, It’s a perfect balance in between. The draw string, the side pockets and the Gorilla Wear logo are flashing red. Get you..
Art.no. 909158000 Color: Gray Quality: 80% Cotton & 20%Polyester This Joggers is just right. They are not too wide and they are also not too tight fitting, It’s a perfect balance in between. The draw string, the side pockets and the Gorilla Wear logo are flashing r..
Art.no. 909155000 Color: Red Quality: 80% Cotton & 20%Polyester This Joggers is just right. They are not too wide and they are also not too tight fitting, It’s a perfect balance in between. 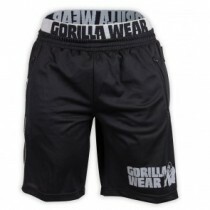 The draw string, the side pockets and the Gorilla Wear logo are flashing re..
GW Athlete Oversized Shorts Black Art.no. 9091390010 Color: Black Quality: 100% polyester Like to hang loose? Now you can with the brand new Athlete shorts! Wear them with your favorite Athlete T-shirt or Gorila Wear top. We used a unique blend of mesh fabrics to make sur..
Los Angeles Sweat Shorts Art.no. 9091990006 Color:Black Quality: 80% Cotton & 20%Polyester This Sweat shorts is ideal for casual and for fitness use. 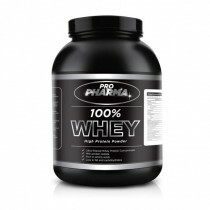 As you can see this product had the New Gorilla Wear LOGO patch on the left bottom. Given it that extra Gorilla Wear flavor. In addi..
Pittsburgh Sweat Shorts Art.no.909189000 Color: Black Quality: 80% cotton/ 20% polyester This nice loose fitting sweat short is simple in its designed. The main focus during the production of this sweat short was mainly comfort. So it is a pants you can sleep in if you want to, it is so co..
Pittsburgh Sweat Shorts Art.no.909188000 Color: Gray Quality: 80% cotton/ 20% polyester This nice loose fitting sweat short is simple in its designed. The main focus during the production of this sweat short was mainly comfort. So it is a pants you can sleep in if you want to, it is so com..
Saint Thomas Sweatpants Art.no. 90932900 Color: Black Quality: 80% cotton + 20% polyester. The Saint Thomas products are a totally new designed line in our collection. Despite they are really comfortable and stylish, a new designed circular logo adds to the uniqueness of these products. With..
Saint Thomas Sweatshort Art.no. 90950-900 Color: Black Quality: 80% cotton, 20% polyester The Saint Thomas sweat shorts are a brand-new addition to our collection. They are very comfortable, stylish and can be worn for any occasion. With our well-known brand name on both sides, a new designe..
Saint Thomas Sweatshorts Art.no. 90950800 Color: Mixed Gray Quality: 80% cotton + 20% polyester. The Saint Thomas products are a totally new designed line in our collection. Despite they are really comfortable and stylish, a new designed circular logo adds to the uniqueness of these pro..
San Jose Men's Tights Art.no.90928904 Color: Black/Gray Quality: 72% polyester, 28% spandex Get supreme levels of comfort during your workout in these men's tights from Gorilla Wear USA. Made with comfort and performance in mind these tights have been crafted using high-quality f..
Shelby Shorts Art.no. 90914980 Color: Black/Gray Quality: 100% Polyester This nice loose fitting short is unique in its design. The main focus during the production of this short was mainly comfort and quality. The Shelby shorts are so comfortable and made out of the finest materials. ..
Shelby Shorts Art.no. 90914920 Color: Black/Neon Lime Quality: 100% Polyester This nice loose fitting short is unique in its design. The main focus during the production of this short was mainly comfort and quality. The Shelby shorts are so comfortable and made out of the finest materi..
Shelby Shorts -στενη εφαρμογη Art.no. 90914950 Color: Black/Red Quality: 100% Polyester This nice loose fitting short is unique in its design. The main focus during the production of this short was mainly comfort and quality. The Shelby shorts are so comfortable and made out of the finest ma..
Track Shorts Black/Gray Art. no: 9091290800 Color: Black/Gray Quality: 100% polyester The gorilla development team was busy to create something special. Something that’s not just for every monkey. We created something for the real GORILLA’S! With pride we introduce you to the new..
Track Shorts Black/Red Art. no. 9091290500 Color: Black/Red Quality: 100% polyester The gorilla development team was busy to create something special. Something that’s not just for every monkey. We created something for the real GORILLA’S! With pride we introduce you to the new item ..
Track Shorts Black/Yellow Art. no. 9091290200 Color: Black/Yellow Quality: 100% polyester The gorilla development team was busy to create something special. Something that’s not just for every monkey. We created something for the real GORILLA’S! With pride we introduce you to the new..